Major League Baseball has had its share of troubled times. In terms of sheer dirt, three scandals rise to the top: Shoeless Joe and the Black Sox, the 1985 Pittsburgh drug trials, and the steroid era. The former and latter have been covered extensively. 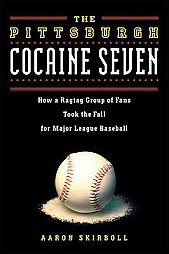 Yet there has never been a book detailing the biggest drug trials in baseball history. The Pittsburgh Cocaine Seven tells the whole story in all its shocking details. The MLB participants were among the game's elite, as a virtual all-star team had come to Pittsburgh. Implicated as cocaine users: Keith Hernandez, Dave Parker, Lee Mazzilli, Dusty Baker, Lonnie Smith, Joaquin Andujar, John Milner, Dale Berra. Mentioned as using amphetamines: Willie Mays, Willie Stargell. But the guys who took the fall for these superstars were just average fans, not heavy hitters or major drug dealers, and this book reveals the often comic circumstances of how they set up deals--and how they got busted. In 1985, it seemed the league was poised to implement a drug testing policy for the players. Obviously, that didn't happen, and because of this inaction, the steroid era came along--and with it all of the broken records that transformed the sport. That's what makes this story so relevant today.